There are very few such soundtracks as John Williams' scores for Star Wars to be so magnificent, describing the spectacular space and star wars in such a vivid way. 10 years after the third installment of Revenge of the Sith, the Oscar-winning composer is back with Star Wars 7 soundtrack. Now users can purchase the 23-track album opening with "Main Title and the Attack on the Jakku Village" on iTunes Store at $11.99. But if money is what you concern most and you are rushing for downloading Star Wars Episode VII film soundtracks MP3, you will definitely need this guide for advanced indulging in the spectacular film score. Here introduced a solid yet free online video downloader and detailed steps. 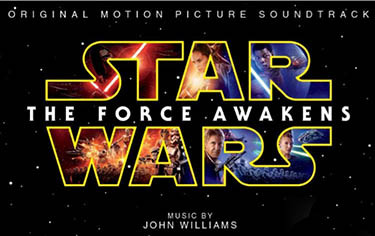 Despite Star Wars: The Force Awakens soundtrack won't be available until the movie hits the theatre. But you can still find the desired music from the Star Wars 7 trailer on YouTube. So you can save Star Wars Episode VII: The Force Awakens soundtrack to play it in different manners, such as offline playback through difference devices. MacX YouTube Downloader is the best free movie soundtrack downloader software that performs Star Wars 7 soundtrack download as well as The Force Awakens full movie/HD trailer download as easy as a pie. Don't worry about the adware, spyware or malware, it is 100% clean and free, letting you save soundtracks (Star Wars 7 included), 3D Blu ray movies, TV shows, music videos, and even 4K UHD videos from YouTube, Dailymotion, Metacafe, Vimeo, Facebook, and other 300+ sites in a breeze. Here we take downloading Star Wars: The Force Awakens soundtrack from YouTube as an example. Before you go, make sure you've downloaded this program and installed it on your computer. Step 2: Specify an output video format/resolution/codec/file size based on your device or player. MP4 is highly recommended for its wide compatibility with phones and tablets. Step 3: Hit "Browse" to set a target folder. Step 4: Tap "Download Now" button and the Star Wars 7 soundtrack download starts. After a few seconds, you can transfer the downloaded soundtrack to iPhone, iPad, Android for playback. For music buffs, video files, even the widely known MP4 video, eat up more space than audio ones. So hunting for a solution to convert the downloaded Star Wars episode VII: The Force Awakens soundtrack to MP3 for listen on mobile devices is much needed. 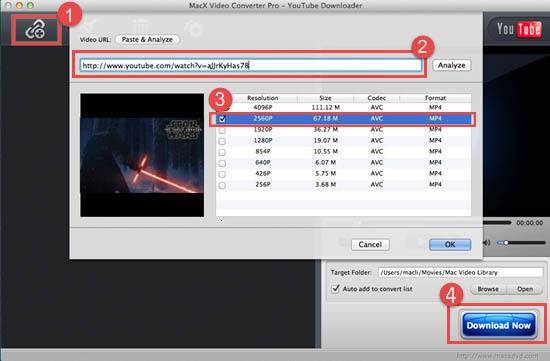 MacX Video Converter Pro is an all-in-one music video downloader and converter for both PC (Windows 10) and Mac that helps you to download and convert Star Wars 7 soundtrack, full movie, music video and HD trailers from YouTube and other online sharing sites to MP3 and other audio/video formats, covering MP4, MOV, FLV, AVI, WMV, etc up to 16X faster, thanks to its hardware acceleration technology. Step 1: Download, install and run the Star Wars 7 soundtrack downloader. Step 2: Click "YouTube" button on the main interface. Step 3: Copy and paste the Star Wars 7 soundtrack to be downloaded. Step 4: Go to the preset profile "To Music", "MP3" as the output format. Step 5: Press "RUN" to download and convert Star Wars 7 soundtrack at once. Movie buffs have various ways to download Star Wars 7 soundtrack. 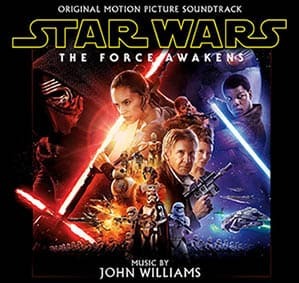 Besides listening the music score online, they can even download Star Wars: The Force Awakens soundtrack torrent MP3 if there is a magnet link. Wait, you can only find the torrent files online after the Star Wars 7 is officially released. Note: Movie torrents download is usually involved in virus or spyware and it is actually an illegal activity in most countries. So be careful before downloading. Step 1: Go and Find the Star Wars Episode VII soundtrack/movie torrent from the sites like Pirate Bay. Step 2: take language, subtitle, format, and most importantly, the safety and download speed, into account by courtesy of seeder to leecher ratio. Step 3: Get a torrent client to ensure the MP3 Star Wars 7 movie soundtrack downloading process. Step 4: Move on and start downloading the music score for Star Wars 7. Step 5: For a limitless playback, go and find a HD video converter to convert the Star Wars 7 torrent to MP3 or other formats for your mobile. If not, skip the step.